Your AWS resources is inside a private VPC that's inaccessible from the outside world. In our specific case, we have Lambda functions located inside a VPC together with ElastiCache. I needed a way to load data into ElastiCache. Solution (note: this is not be step by step, I'm just recreating the required components; there's probably a wizard for this or something). Create an Internet Gateway. Let's name this igw-12345. Create a subnet for igw-12345 and in your Route Table, point 0.0.0.0/0 to igw-12345. Let's name this subnet subnet-2468. Launch an EC2 instance and put it inside vpc-111. Enable public IP auto-assignment. Select subnet-2468 for your instance. You can now access the AWS resources inside the instance or you can use SSH tunneling to access them from your workstation. These are my notes for installing Apache Nutch v2.3.1 on Ubuntu in my work. We'll probably not use Nutch 2.3 because AWS ElasticSearch doesn't support the native transport protocol (it only supports the REST API, and it exposes it in a non-standard manner on port 80); thus we'll have a hard time indexing the data unless we maintain the servers ourselves. We can probably use AWS CloudSearch, but Nutch 2.3 doesn't have a plugin for it, unlike Nutch 1.13. Anyway, there are lots of similar HOWTOs out there, but this one points to specific versions and URLs so you can just copy and paste these to get your system up and running in a few minutes. Updating to the latest version is needed to fix the glibc bug that affects MongoDB. It’s probably not required anymore, but it’s good to be safe. Create a new AWS ElasticSearch domain and whitelist the server(s) where Apache Nutch is installed. AWS ElasticSearch doesn’t support the native transport protocol (port 9300). We may be able to use AWS if Nutch supports the HTTP REST protocol. Needs more research. # It's possible to use the latest version, ES5, but you need to update the indexer. We're using AWS ElasticBeanstalk in one of our projects at my work. 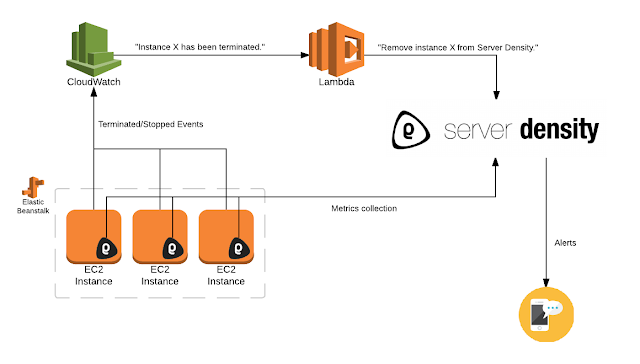 EB is an abstraction on top of Elastic Load Balancing and EC2 (which is yet another abstraction on top of Xen, but I digress hehe...), and I really appreciate how it simplifies a lot of routine sysad tasks. EB allows us to scale the website up and down, depending on the traffic. One problem that we encountered during development was a memory leak from PHP. To prevent another downtime (or at least help predict when the servers are about to go offline), I decided to use Server Density to implement an early warning system that would give us a heads up when the server's memory is about to run out. Server Density is a pretty great service. We've been using it for quite some time now. Server Density works by letting you install an agent inside of your servers, and the agent will then continuously push metrics to their server. Server Density then collects all these logs and displays them into nice graphs. If a metric crosses the threshold in one of your conditions (i.e., if the CPU load is >= 90% or disk space is <= 5GB), Server Density then sends you notification via e-mail, SMS, and Slack. Determining the amount of free memory in Linux is somewhat tricky. I can't use the memory usage metric to trigger a notification because Linux always shows that nearly all of the memory is being used, even though in reality they're just being used as cache. To get a more reliable metric, I used swap space instead. The theory is that the instances are supposed to have enough RAM for the tasks; when memory runs out, Linux uses the swap space as a last resort. Thus, we can check if swap space is >= 1MB to trigger a notification. Next problem: since EB regularly deploys and terminates the instances, Server Density ends up monitoring servers that no longer exist. We needed a way to automatically stop Server Density from monitoring instances that have been terminated. Solution: I made a CloudWatch rule that triggers whenever instances are stopped or terminated. The events are then pushed to a Lambda function which calls Server Density's API to remove the monitoring. I think CloudWatch has a way to monitor the swap space, but the last time I checked, AWS SNS (a separate AWS service that sends notifications) can't send SMS messages to Philippine numbers so I can't wake up (not joking, unfortunately haha) whenever there are server problems. I'm trying to run an AWS Lambda function inside a VPC because I need it to access ElastiCache. Problem: if you put a Lambda function inside a VPC, it loses Internet access. There are some few documentations online, but they are too complicated and they involve unnecessary steps. 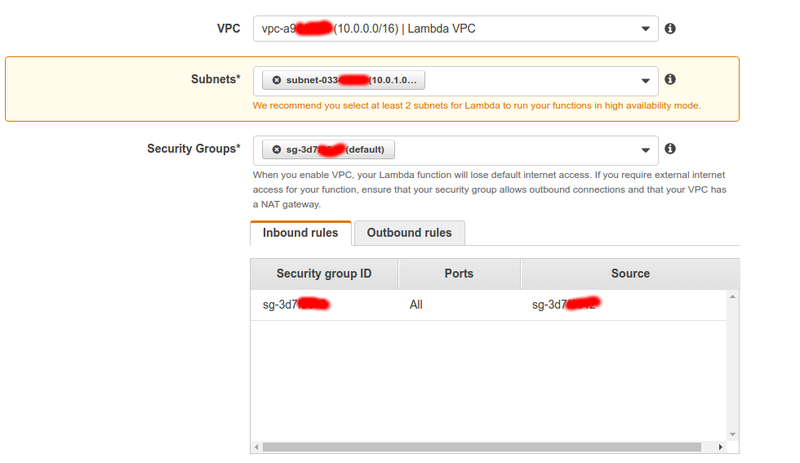 Here is the simplest way to run AWS Lambda inside VPC. 2. Run the above function without a VPC to verify that it's working correctly (i.e., it returns an HTTP 200). 3. In the AWS Console, go to the VPC page and click "Elastic IPs". Then, click the "Allocate new address" button and select the "VPC" scope. 4. Next, go to the VPC Dashboard and click the "Start VPC Wizard" button. 5. Select VPC with Public and Private Subnets option. 6. In the next page, enter your "VPC name", and in the "Elastic IP Allocation ID" field, enter the Elastic IP that you created in Step 3. Click the "Create VPC" button. 7. Finally, go back to the Lambda page and configure your function. Click the "Configuration" tab and go to the "Advanced settings section". 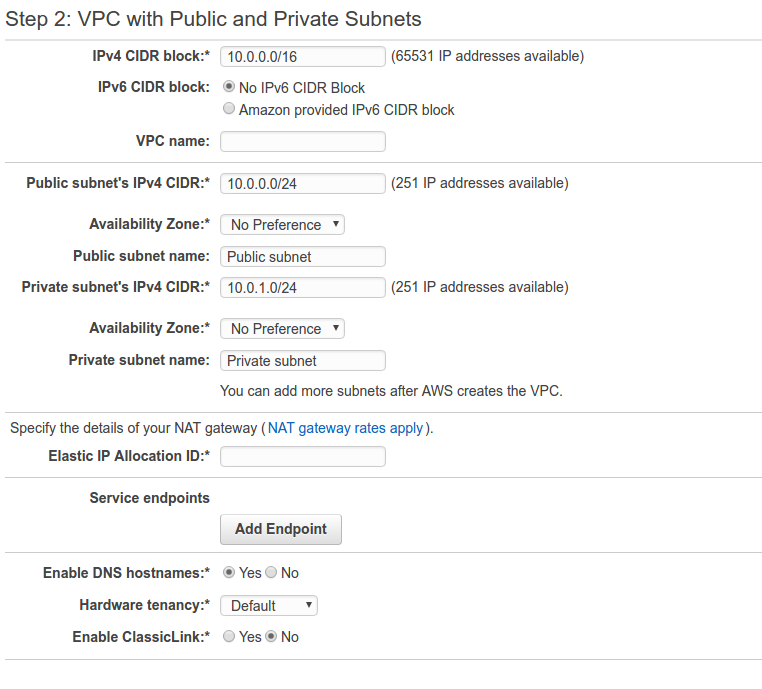 Select the VPC that you created in Step 5, and Select the private subnet that you created. This is important; otherwise outgoing Internet connections won't work. 8. Click the "Save and test" button to test your setup. That's it! For a proper setup, use at least 2 subnets in different availability zones to run your function in high-availability mode. 1. Create a bin/ directory inside your project directory. 2. Statically compile your binary as much as possible. Put it inside your bin/ directory. Put any shared libraries that it needs inside the bin/ directory too. 5. ZIP your project directory and upload to AWS Lambda. Enjoy! I've been enjoying AWS Lambda in my work lately. I appreciate how we can create serverless architecture (or nearly serverless, anyway) on the AWS Platform. Yeah, it's fun to set up Linux and/or FreeBSD servers myself, but oftentimes, this "cloud" thingy makes perfect sense in many scenarios. Anyway, AWS Lambda has various constraints, such as not being able to install packages yourself. These constraints, according to their documentation, allows them to "perform operational and administrative activities on [our] behalf, including provisioning capacity, monitoring fleet health, applying security patches, deploying [our] code, and monitoring and logging [our] Lambda functions." With the recent update, however, the above code no longer works. On AWS Lambda platform that uses Node.js v4.3+, we'd need to copy all the binaries to the /tmp folder, chmod +x it, and run it from there.